We happened to be in the Boston area for the weekend so I decided that while we were there I would take my son who is a high school junior to look at two area colleges. We sat through two information sessions and went on two student-guided tours. It had been a while since I had visited colleges as my oldest son is now a senior in college and, truthfully my husband did most of the college visits back then. The first information session we went to was an hour’s worth of torture so I started to ponder what improvements I would suggest to an admissions officer if I were given that chance. It was either that or pass out where I sat and I didn’t think either my son or the admissions officer would appreciate that very appealing option. What follows are my personal thoughts and do not reflect the thoughts or opinions of anyone else in my family. First, contrary to Mr. admissions officer’s misguided observation I did want to hear statistics even though I could easily read them in the barrage of paper paraphernalia scattered about the admissions office. Honestly, I came to visit your campus because I wanted to be spoon-fed the salient statistics. What I didn’t want to hear was every interesting experiment that your professors are working on. Yes, many of them are intriguing but some of them aren’t and that’s not really what I came to hear. And, FYI an hour is just too long. No information session needs to be longer than half an hour. Second, I would appreciate a lot more honesty and a lot less pandering. In both information sessions there was a long spiel given about “holistic” review of applications leading to what I think is a misleading assumption by some that no matter how low your GPA and SAT scores are you have a chance of getting into a school if your “softs” (i.e. recommendations, essays and extracurriculars) are good. Below a certain number it’s just not true. I think they should discuss the elephant in the room. Why can’t they JUST SAY IT? Being opaque led to a question and answer session at one school where parents spent twenty minutes asking about the alumni interview. Instead of saying it doesn’t really matter up front, the admissions person answered the questions until he finally had to admit that unless you murder the interviewer, the interview can’t hurt you and very rarely makes any difference at all. And, even if you do murder the interviewer, if you have a 2400 on your SAT, a 4.5 GPA, are a concert pianist, a talented artist, a ranked tennis player and have cured a rare disease you will be offered a spot in the class. One information session was set up with a tag team of an admissions officer and a student. The admissions officer would ask the student if, for instance, she knew anyone who had gone abroad. “In fact I do” she would answer and then proceed to tell us about that “person.” The entire session continued in that vain. It was a veritable facsimile of Shakespearean theater, but poorly done. It was so canned that my twelve year old bought it hook line and sinker. Thanks, but next time I’ll go to Broadway if I want to see a show. I just want brevity and honesty in a narrative style, with numbers. What are you looking for in prospective students? And, why would a student want to come here? Just the facts Ma’am, but the honest to goodness facts. Evil visited Boston last week in the guise of two seemingly ordinary young men in black and white baseball caps. In fact, they seemed so ordinary, we didn’t even recognize that they meant us harm. It brought to mind the term, “banality of evil” which was coined by Hannah Arendt with reference to Adolf Eichmann, and referred to the shocking ordinariness of Eichmann, a man responsible for the deaths of millions during WWII. All we could do on Marathon Monday was shake our heads and wonder “why” and hope that if the answer to the “why” of it was revealed, somehow it would bring a measure of peace or at least understanding but, alas, it did no such thing. In fact, only questions remain, so many unanswered questions. How do we make sense of a beautiful young girl who loved to dance and now faces the rest of her life with one leg? How do we make sense of a scrawny, misguided nineteen-year old boy who just tossed his life away in the most brutal fashion imaginable, and will inevitably wake up to that fact and wonder how he got where he is? How much hate must a person carry with them to do a thing like this? How do we make sense of the randomness of people’s injuries? Just being a few inches to one side or another meant the difference between death, loss of a limb or walking away without a scratch. How does one function in a world filled with such disorder and chaos? There are no answers so I’m choosing to find comfort as so many others have in this last week. I choose to put my faith in the essential goodness of the human spirit. 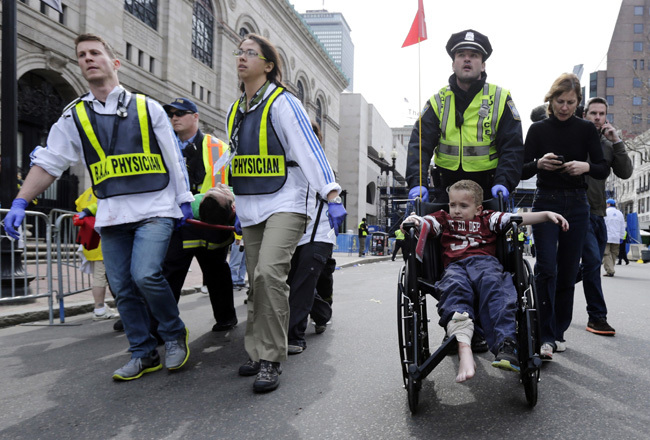 I’ll continue to watch and read about all of the amazing “helpers,” the regular citizens and the first responders who completely contra to human instinct ran toward the blast to help the wounded while others offered shelter, food, phones, hugs and anything else they could think of to stranded runners. And, I’ll remember my personal history. I am here only because seventy years ago there were other “helpers,” who hid my mother and grandmother on their attic for over a year at tremendous personal risk to themselves. Sometimes, it’s easy to forget how deep the reservoir of human goodness flows and although the evil-doers may have been ordinary, the kindness and generosity with which people responded to their evil was simply and spectacularly extraordinary.